Mesothelioma is a form of cancer that attacks the protective membrane covering the internal organs. Mesothelioma is most commonly found in the linings of the lungs, but it can also affect the mesothelium surrounding the abdominal organs, heart, or testicles. It is estimated that mesothelioma affects between 2,500 and 3,000 people annually in the United States. Exposure to asbestos is the leading risk factor for mesothelioma. Asbestos, which is a naturally occurring mineral, is resistant to heat. It was used extensively from the 1950s through the 1970s as insulation in floors, pipes, ceilings, and heating ducts before being banned in 1989. When asbestos fibers become airborne, they can be inhaled or swallowed. The fibers can settle in the lungs or stomach and cause irritation that can lead to the development of mesothelioma. Approximately 1 in 20 people exposed to asbestos at work or home will develop this aggressive form of cancer. Those most at risk for mesothelioma are men over the age of 60 who worked in construction, shipbuilding, plumbing, and similar industries that frequently utilized asbestos products. You may also be at risk if you live with someone who works with asbestos since they may bring home asbestos fibers on their hair, skin, and clothing. Asbestos can also be found in some geological formations called ophiolites. If weathering, mining, or other activities release these particles into the air, people in the surrounding area have a higher risk of developing mesothelioma. You may also have an increased risk if you have a close family member with mesothelioma or if you have had high-dose radiation. Some experts are also of the opinion that some people may have a genetic predisposition to mesothelioma. Most patients with mesothelioma do not develop symptoms until decades after their initial exposure. Some people with a long history of asbestos exposure never develop mesothelioma while others who have only had brief exposure go on to develop the disease. It is important to note that mesothelioma is exceedingly rare, especially among individuals who do not have a history of asbestos exposure. A number of other health conditions can also cause the same symptoms as mesothelioma. If you experience any of these symptoms, you should see your doctor for a proper diagnosis. 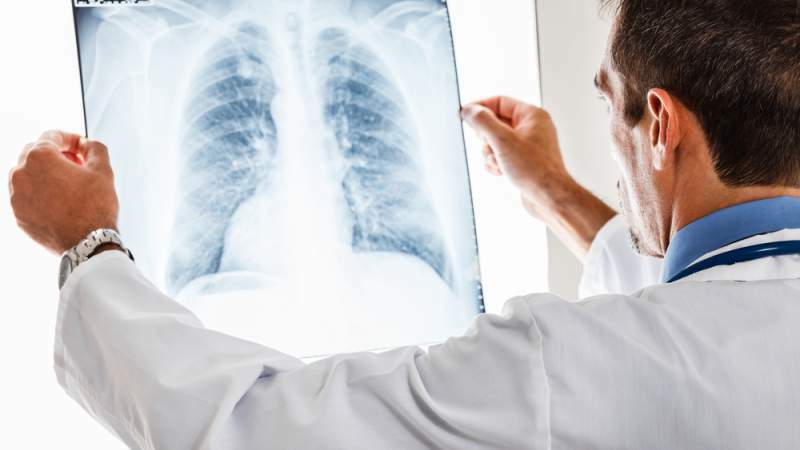 If your doctor believes that your symptoms are consistent with mesothelioma, he or she will most likely order imaging scans of the chest or abdomen, including X-rays, MRIs, PET scans, or CTs. Based on the results of the imaging scans, your doctor may proceed with further tests, which may include a biopsy. If your doctor confirms that you have mesothelioma of the lungs, your doctor will stage the cancer by determining the extent to which it has spread to various parts of the body. Stage I mesothelioma is still localized and only affects one portion of the chest lining. Stage II mesothelioma indicates that the cancer has spread beyond the chest lining and may affect the diaphragm or lung. Stage III mesothelioma involves nearby lymph nodes and structures within the chest. Stage IV mesothelioma is considered advanced, and the cancer has spread extensively throughout the chest and possibly to other parts of the body. Mesothelioma of the abdomen is much less common and is not staged. Treatment for mesothelioma is largely dependent on your general health, the stage and location of your cancer, and your treatment goals. If the cancer is diagnosed early, surgery may be possible to remove the cancerous tissue. In rare cases, this may provide a cure for some patients. Chemotherapy may be used before or after surgery as a means of shrinking tumors, slowing the growth of cancer cells, or killing cancer cells that may remain following surgery. Unfortunately, the majority of mesothelioma cases are not diagnosed until the cancer is too advanced for there to be any chance of a cure. In this case, it is important to discuss your treatment goals with your doctor. If you opt for treatment, your best options include chemotherapy, radiation, or participating in a clinical trial involving investigational treatment options. Some patients prefer to forgo treatment and work with their doctor to find ways to control symptoms so that their remaining time is as comfortable as possible. Lifestyle changes and alternative therapies have not proven successful in treating mesothelioma, but they may help in managing some of the symptoms. For example, acupuncture, relaxation exercises, and controlled breathing techniques help some patients deal with the breathlessness caused by increased pressure in the chest. The prognosis for the majority of mesothelioma patients is poor. A diagnosis of mesothelioma is devastating for both the patient and their family. If you have received such a diagnosis, you can try to regain a sense of control over your situation by educating yourself as much as possible about your condition so that you can make informed decisions about your treatment. Surrounding yourself with a strong support network and talking with others living with cancer can help you cope with the emotional aspects of your diagnosis. It is also important to talk to your family and health care team about preparing an advanced directive and a power of attorney. This will allow a person that you designate to carry out your wishes and to act on your behalf if you are unable to do so yourself. Individuals working in occupations with a risk of asbestos exposure should follow all of their employer’s safety precautions. This includes wearing protective equipment and showering and changing clothes to prevent transferring asbestos fibers to others. If you live in an older home, you may come across asbestos during remodeling projects when knocking down walls or tearing up floors. You should never try to remove suspected asbestos yourself. In many cases, this can be more dangerous than leaving the asbestos intact. You should always consult a professional asbestos remediation service that can assess the danger and remove the asbestos safely.